It's just $90 today, a great drop from its list price of $130. 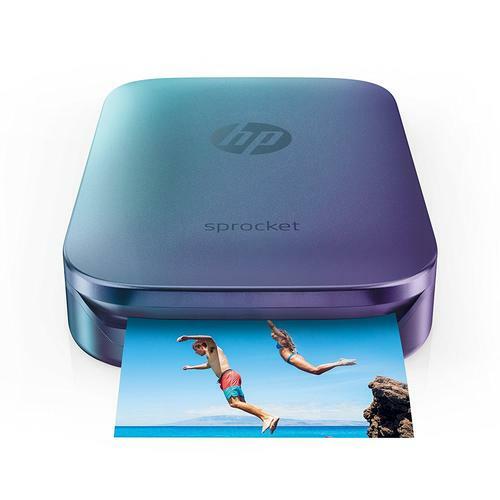 The HP Sprocket Photo Printer is a cute, easy way to print out memories from your phone instantly. Right now the HP Sprocket is on sale for $90 in the blue versionRemove non-product link, its lowest price ever on Amazon and a steep discount from its $130 list price. The first thing to know about this printer is that it’s convenient. The Sprocket runs on battery and connects via Bluetooth to almost any mobile device. It prints photos onto a small size of photo paper (2x3 inches) without the need for separate inks—the ink is embedded in the special paper. The free app (Android and iOS) lets you edit photos, look at collections, and even add frames and emojis. The photo printer is small—4.6 x 3 x 0.9 inches—so it’s easy to take with you on any adventure. It works especially well for handing out happy snaps while you’re out with friends. The photo stock has a sticky back, so you can quickly add it to a locker door, a laptop lid, or a memory board. The second thing to know is that its quality is more about quick than good. We’ve reviewed prior versions of this printer, and the print quality was often mediocre, with banding and odd colors. The special photo stock is very expensive, too—about 50 cents per photo! More recent reviews seem to indicate that neither the mediocre quality nor the high costs have improved. People apparently love it for other reasons, though, because it has 4.1 stars out of 5 on Amazon with nearly 1,200 user reviews. We won’t argue with fun.